I am all about quality and quantity in my shoe boxes. So when I design a sewn or crocheted item I make sure it is well made but also very simply made so I can produce more to reach more kids. So this is a super simple drawstring bag. I do not square off the bottom corners, but you could choose to do that easily when you are finished. I figured it would be roomier without it boxed if the child used it for items not in the shoe box. REMINDER: There has been some confusion with this. 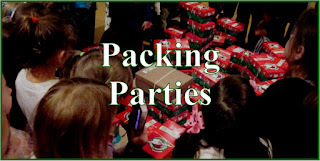 The shoeboxes should not be sent to Samaritan's Purse in the bags, the bags are just sized this way, so once they make their way to the child inside the shoebox, the child will have something in which to carry the shoebox and the rest of the goodies inside of it. 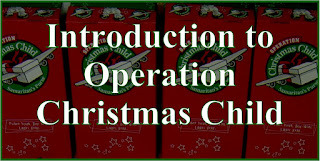 NOTE: The following instructions are for a tote bag just large enough to carry the Operation Christmas Child"Cardboard Go Boxes". 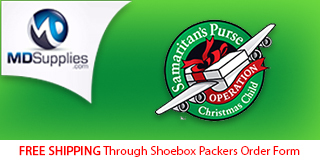 Below are also instructions on how you can figure the size needed for any shoe box. 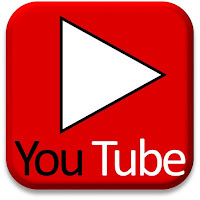 I have used white thread so it will show up well in the images. Serged edges. Note: looks like my loopers need adjusted :-) . With right sides together sew the two long sides from the pins down to the bottom while leaving above the pin open. Prepare your drawstrings of choice. 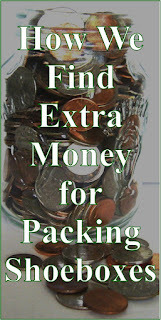 Feed one drawstring thru one side and then down the other side. Pull drawstring ends up evenly and tie the two ends together. Repeat starting at other end of bag. Pull on both drawstrings at the same time and the bag closes. Cut each drawstring 32 1/2" x 1 1/2"
Finished Drawstring; 2nd pressing of drawstring; 1st pressing of drawstring. Tip: You may need to move the needle over to the right a bit to get the narrow fabric to be under the needle and to move along with the feed dogs. Shoe boxes come in such a variety of sizes. 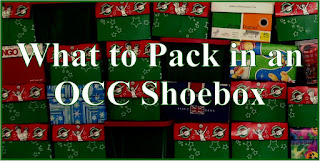 If you'd like to make a special bag to fit a shoe box you have this is how you can do it. Measure around the width (the short way) of the box. Add 4” to this measurement and divide the total by 2. This equals the width of your fabric. Measure around the length (the long way) of the box. Add 8 1/2” to this measurement and this is your length of fabric. Drawstring will be the measurement of the width (no.1 above) plus 11”. Example: 22" + 11" = 33"
If you have scraps of fabric smaller than the 3/8 yard needed for the full the bag just piece them together to make your own fabric to fit the size needed to make your bag. Finish all raw edges to keep them from fraying and coming apart. 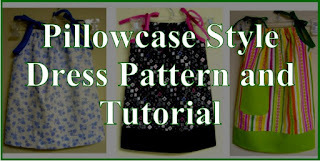 Choose a style of bag above and sew as instructed. I have done this with a variety of fabrics for one bag as well as patching together pieces of the same fabric to make it wide enough to cover a box. It is a good idea to stitch your seams down for added strength. 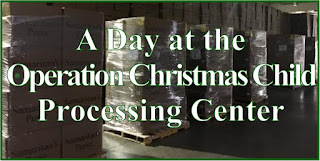 Click image for illustrated, step by step instructions. 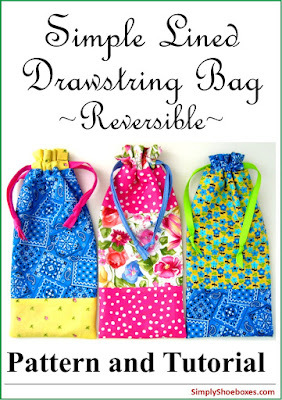 So many people have requested a tutorial on the drawstring tote bags that I know I can’t get the word out to them all. I’d love to have you share this post on social media networks so others can find it and enjoy making them, too. There are share buttons at the bottom of this post for your convenience. Thanks. I’d love to hear from you if you make a bag. 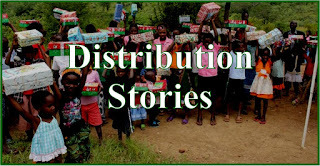 You can share a picture on the Simply Shoeboxes Facebook page, I’d love to see them! Tuck the finished bag in a zipper lunch bag and squeeze out the air. Takes up little room in the shoe box. 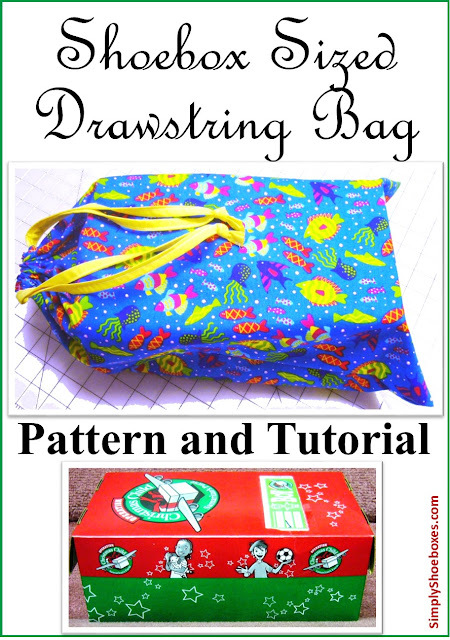 Here are some earlier instructions I posted for how to make small drawstring bags, good for pencils, toys, etc. 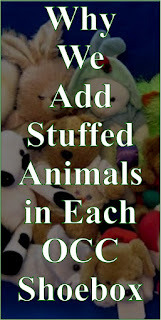 And here's one for a pencil pouch pattern and tutorial -- perfect for a hygiene kit, too. And if you'd like some inspiration and tutorials for other drawstring bag ideas you can stop by Threading My Way's ongoing linky. 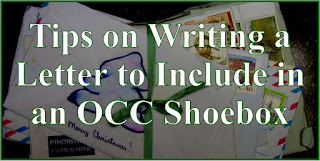 Want more crafting ideas for your shoebox gifts? 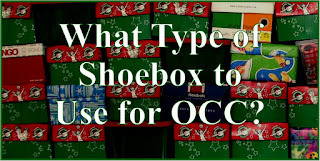 Check out my DIY Crafts for Operation Christmas Shoeboxes ~ How To's and Tutorials Index here on Simply Shoeboxes. 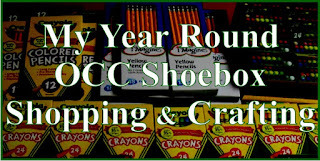 Also stop by Crafting for Shoeboxes on Facebook to join a community of crafters sharing their work and ideas. 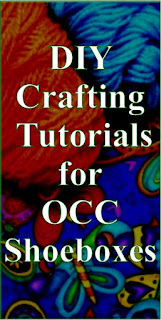 Do you have a pdf for these good pattern instructions? No, I have not had the time to put them in a PDF. As always, a great tutorial. You choose such bright fun fabric for your bags. 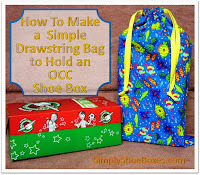 great instructions..I usually make bags to include in my shoe boxes. sometimes I use clear plastic boxes so I use the bag to line the box. I tried, really tried, but just don't understand your instructions. I am not a sewer, have no machine, and would have to do by hand. Have anything a non-sewer could understand?